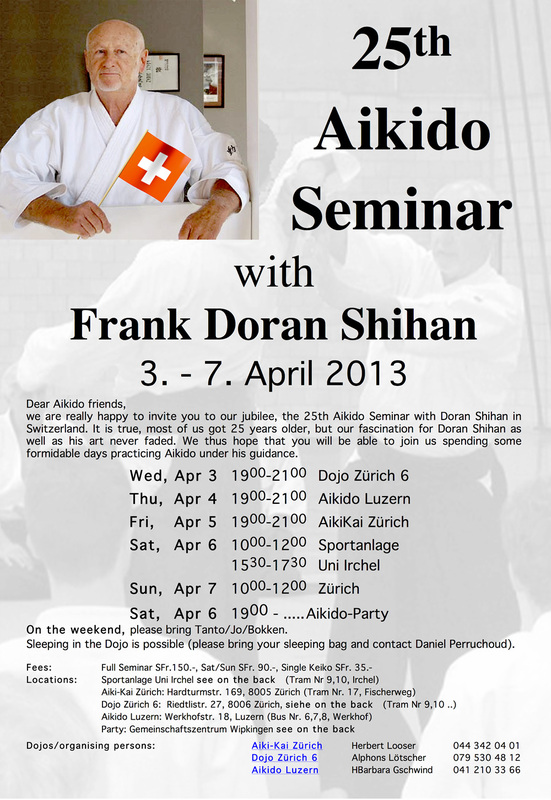 Each year, Doran-shihan comes to Zürich for an aikidō seminar, each time it is very interesting. Chaque année, Doran-shihan vient à Zürich pour donner un stage d’aïkidō. C’est chaque fois très intéressant. Jedes Jahr kommt Doran-shihan nach Zürich um ein Aikidō Seminar zu geben, es ist jedes mal sehr interessant. While interesting, Doran’s seminars tended to be challenging for me, he tends to do complex techniques which look very fluid when he demonstrates them, but which I have trouble reproducing. This year there were less people at the seminar, I think there was some other high-ranking teacher giving one somewhere else in Europe, so people had to make hard choices. While bad news for the organisers and the teacher, I found this helped make the lessons clearer and more serene, and while some technique still confused the heck out of me, I found them generally easier to grasp. I really liked the fact that the techniques are both elegant and very practical, with attacks that are quite different from the usual: knife, leg kicks, you sometimes need to do something different from 正面打ち (shōmen-uchi) 一教 (ikkyō) . This entry was posted in English, French, General, German, Japanese, Seminar, Zürich and tagged Aikidō, Doran.